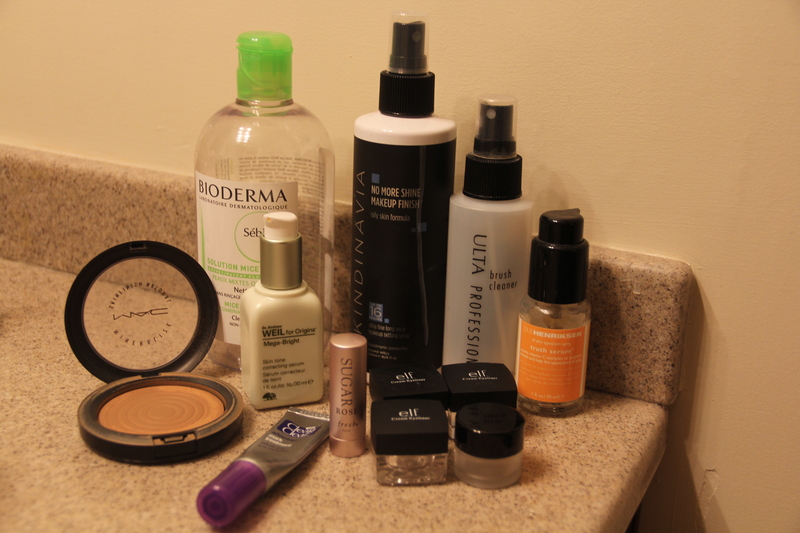 L to R: MAC MSFN in medium deep; Bioderma Sebium H2O solution purifying cleanser for combination or oily skin; Origins Mega bright serum; Clean & clear mark treatment; Fresh Sugar lip treatment mini in rose; Skindinavia no more shine setting spray; Elf gel liners; Ulta professional brush cleanser and Ole Henrikson truth serum collagen booster. The Elf gel eyeliners were a miss! They dried out completely even though I hadn’t used them much since I got them.. Had to throw them.. The Ulta brush cleanser was ok.. nothing exceptional.. I much prefer MAC’s brush cleanser and will not repurchase this..
Fresh Sugar lip treatment mini in rose was a good product.. It would moisturize my lips but I couldn’t justify the price for it especially when there are a lot more cheaper products that do the same..
Clean & clear mark treatment would just dry out my oily skin.. even for spot treatment.. will not be repurchasing!